While modern tradition has seen the round brilliant and the princess cut diamonds favored by brides, the cushion cut once reigned supreme as the first choice for diamond jewelry. The cushion cut was at the height of its popularity during the 19th century and remained there for over 200 hundred years; when we look at the beauty of this classic diamond cut, it is easy to see why. 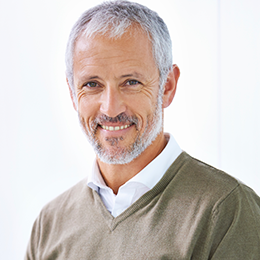 The cut appears as a square or rectangle, with soft, rounded corners. It was first known as an old mine pattern cut, however, since then the cushion cut we now recognize has been modernized and perfected to improve its light performance, baring only the faintest resemblance to its predecessor. 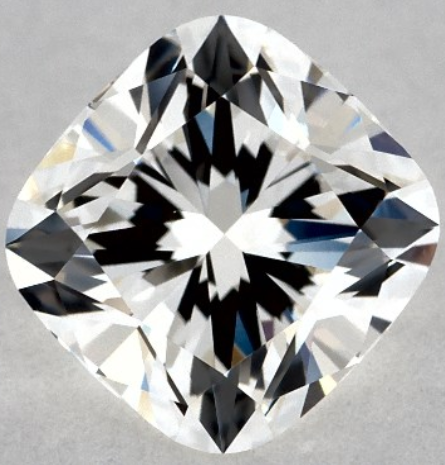 The modifications to the old mine cut eventually resulted in a brilliant cut; this means the diamond has many facets for maximizing light return and brilliance. Light is returned through the top of the diamond meaning, when cut correctly, it will offer exceptional sparkle and vibrancy. As with all cuts of diamond, if you are considering a cushion cut, there are some tips you can follow you ensure you are maximizing the beauty and potential of the diamond. As the cushion cut continues to rise in popularity, so too does confusion surrounding its specifications and appearance. The cushion cut branches into several categories, and each of the facet plots above will alter the final look of the diamond. The GIA identifies two types of cushion cut: the ‘Cushion Brilliant Cut’ and the ‘Cushion Modified Brilliant’. Although these are often referred to simply as Standard or Modified cuts. 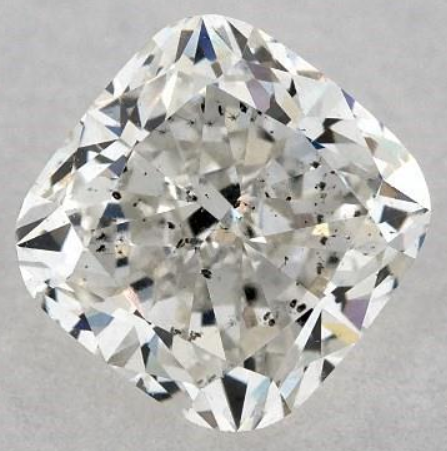 The cushion brilliant cut has facets that closely resemble that of a round brilliant, while the cushion modified brilliant has had facets removed, added or modified. There is actually very little visual difference between a standard cushion cut and a modified cushion cut. If you have been exploring the ins and outs of a cushion cut, you may have already come across the terms ‘chunky cushion’ and ‘crushed ice’. They describe the two most distinctive looks that a cushion cut diamond can present. I must emphasize that the variations between the two diamonds, ‘styles’ is not dictated by their cut category (e.g., standard or modified). These diamonds will have a clear and defined facet pattern when looking into the table of the stone. Much like a round brilliant, you will be able to identify the balance of black and white within the stone. Some people describe them as having a ‘blockier’ appearance due to the strong presence of the diamond table. In contrast, a crushed ice cushion cut will have no discernible pattern to the naked eye. It is closer in characteristics to a radiant cut, with a sporadic and chaotic sparkle when you look into the table. The round brilliant displays symmetry and defined patterning, while the radiant appears much more random. These are the characteristics that determine the difference between a chunky cushion and a crushed ice cushion. 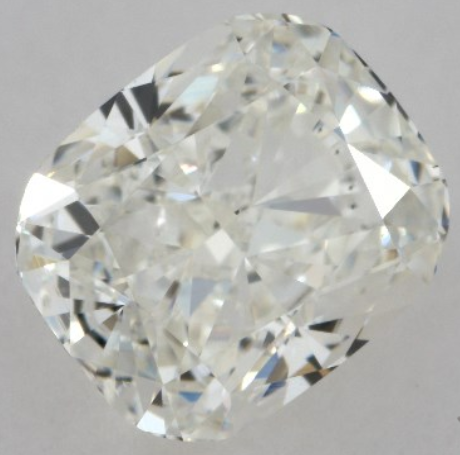 Some have argued that the crushed ice look can diminish the brilliance of the diamond due to fragmented light return and chaotic patterning. Others find the appearance of a chunky cushion cut too ‘blocky’ as the table can appear prominent. 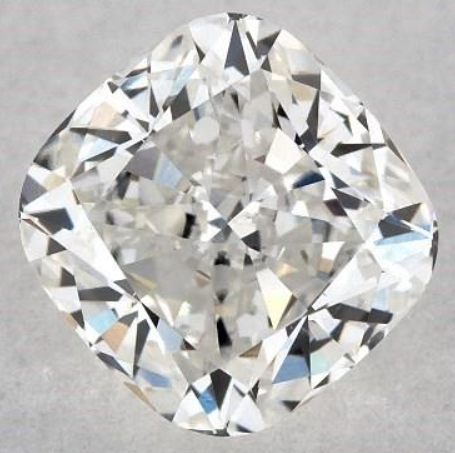 Ultimately, a certificate will never tell you whether or not the cushion cut that you have selected is a chunky or a crushed ice diamond; it is far more beneficial to look at the overall quality rather than getting caught up in the various branches of this complex cut. If you do favor a particular look, it is simply a case of searching for the distinguishing features by eye. If you’re heart is set on a cushion cut diamond I would recommend purchasing from James Allen or Blue Nile, if you’re looking for princess cut or round cut diamonds however head to Whiteflash and look at their A CUT ABOVE line. Choosing the best cushion cut diamond for your engagement ring is all about finding the perfect balance between quality and value for money. While I will always stress the importance of the best possible cut grade, the rest of the 4C’s have a little more flexibility when it comes to choosing your stone. 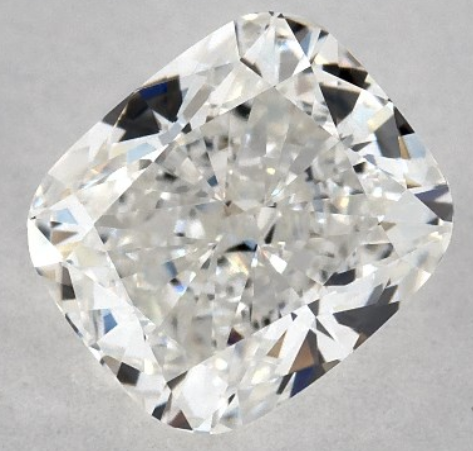 Unlike other diamond cuts, the parameters for a cushion cut diamond are fairly broad. Below I have specified the typically desired proportions. Length to Width Ratio – Cushion cuts can be square or rectangular so there are no ‘ideal’ ratios. It may, however, give some indication as to how big the diamond will look on the hand. Unlike a round brilliant, which is the best cut for masking color, a cushion cut will retain its color. Many fancy colored diamonds and vivid gemstones are cut into cushion or radiant cuts, as they tend to emphasize the intensity of the color. This means that your cushion cut stone will be far less forgiving when it comes to choosing the color grade. I would recommend a minimum of an H in color. If budget allows, a G is preferable, as at this grade the diamond falls into the category of ‘colorless’. However, you will notice a large leap in price between an H and a G, and very few will be able to identify the color difference by eye. Opting for a yellow or rose gold setting will also allow for a little movement down the color grades. An I or a J grade would be suitable for warmer color settings. The large, open table of a cushion cut means that there are less edges and corners to diminish the look of inclusions. Above are four examples of cushion cut diamonds from the James Allen website (two SI2 diamonds and two VS1 diamonds). The diamonds on the left both have inclusions that are visible when looking into the table, however, the diamonds on the right do not. The VS1 diamond on the left has a particularly prominent inclusion in the table, yet it carries a much bigger price tag than the SI2 on the right, which has inclusions towards the edges which are less visible. The point to note here is that if you have your heart set on a cushion cut diamonds, it is possible to find an attractive looking diamond with a lower clarity grade, it will just take some searching. I would advise beginning your search for diamonds carrying an SI1 grading, where a good price can be found for an eye-clean diamond. If you are lucky, you may be able to find an eye-clean SI2, however, be prepared to move up the clarity grades should you fail to find one. 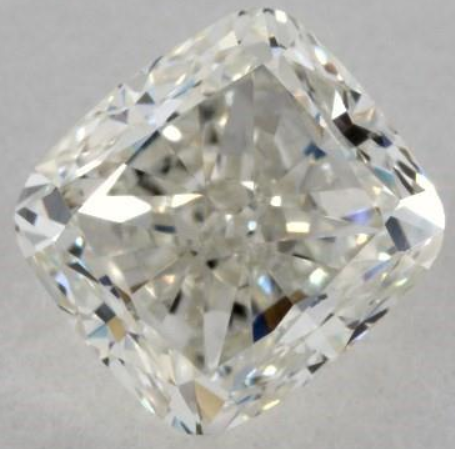 The positioning of an inclusion is everything in a cushion cut diamond, so make sure you are looking at the diamond thoroughly and not just at the certification. It is essential when shopping for a cushion cut diamond online that you opt for vendors who have the absolute highest resolution, 360° imaging available, like Whiteflash and perhaps also consider James Allen. A cushion cut diamond really does need to be seen in order to differentiate between the signature looks (crushed ice, chunky, etc.) and also to identify any inclusions visible when looking into the table. There are many variations of overall shape and style that fall under the bracket of cushion cut, so it is important to look at as many as possible to build a strong image of what you are looking for. Get in touch if you need help in comparing your chosen diamonds.